Thank you to all who have donated to our Marguerite Street Project! We have reached our goal of $8,000 and are excited to see the building of the room begin soon. 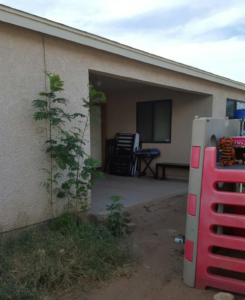 Update on the family: The foster child placed with this family when the project began needed to be moved into a higher level of care and is no longer living in this home. This family has generously opened their doors to a sibling group of two children and will still greatly benefit by the addition of this room. Together we are making a difference in the life of this foster family and the children who have come, and will come into their care! Any additional funds brought in for this project will now be added to our general fund to help support other foster families in need. CLICK HERE to view the 12/13/16 piece on ABC 15 News about this family! Cook Remodeling has partnered with Boost a Foster Family on a project to enclose a patio for an additional bedroom required for a family to be built by the end of November. This foster family took in a handicapped child that had the requirement that the child must have their own bedroom. The family agreed to make the child a part of their family, and the oldest two children gave up their room and sleep in a converted garage. At a recent home visit, the case manager told the parents they must build an additional bedroom to code, and they have a deadline of November to have the project completed, or the handicapped child will have to go back to an institutional group home. They do not want this to happen, and have little cash to do it. Help us enclose this patio! The family is getting a building permit to enclose their patio. Many building supplies have been donated by a local Home Depot. Cook Remodeling is donating time and expertise as the General Contractor and Project Manager. Still, $8,000 needs to be raised to pay for construction installation costs as soon as possible. All donations are tax deductible. Please list the “Margarite St. Project” in the instructions or subject line of your donation.